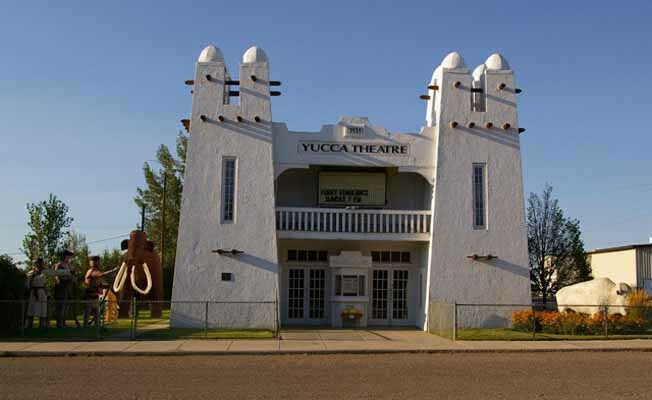 The Yucca Theater was built in 1931 by brothers David and Jim Manning and is listed on the National Register of Historic Places. After years of nonuse, the theater was renovated back to its original look in recent years. The entire building consists of the theater in the front and the previous residence of the owners of the theater, David and Ruth Manning, in the rear. The architectural style is very unusual for Montana. David Manning designed the theater to look like the buildings he had seen in the southwest. David Manning was a member of the Montana House of Representative for 53 years. The theater and Manning residence are part of the Treasure County 89'ers Museum complex. The theater is open upon request to visitors of the Treasure County 89'ers Museum. The museum is located across the street from the theater. Local sculptor, Bob Schulze, sculpted statues of Sacajewea, William Clark, Pomp and the Hunter. These statures are located on the lawn of the Yucca along with a white buffalo, a woolly mammoth and a saber tooth tiger. A British 1931 Austin automobile originally owned by the Manning family and an early 20th century gasoline pump are on display in the theater lobby. The back of the building houses a display of antique dresses, uniforms and equipment from Treasure County veterans of World War II, and items of local family history. Modern movies are shown on Sunday evenings at no charge during warm weather months. Plays and other entertainment are scheduled throughout the year. See also the listing for the Treasure County 89'ers Museum. Take the Hysham exit off I-94 and proceed two miles north on the Frontage Road to Elliott Avenue, the main street of Hysham. The Yucca Theater is located at the intersection of Elliott Avenue and Spurling Street.Take the Hysham exit off I-94 and proceed two miles north on the Frontage Road to Elliott Avenue, the main street of Hysham. The Yucca Theater is located at the intersection of Elliott Avenue and Spurling Street.